By Father Kevin Murray, C.Ss.R. 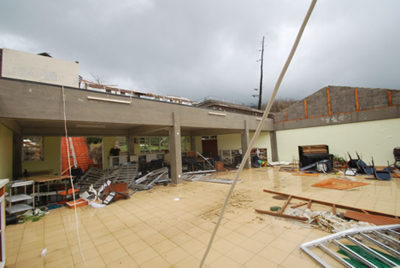 This photo of the dining room of Holy Redeemer Retreat Center in Roseau, Dominica, shows a sample of the devastation Hurricane Maria caused to the island. There is a ferry boat service from St. Lucia to Dominica. Having lived and ministered in St. Lucia for the past six years, I have been to the ferry terminal in the capital city of Castries many times. Normal departure for the boat is 7 in the morning; check-in time begins two hours before leaving. The usual scene at the terminal includes a line of 75 or more people with a reasonable amount of luggage ready to make the trip. On the morning of October 3, two weeks after the destruction caused by Hurricane Maria in Dominica, the scene for ferry boarding was anything but usual. More than 100 people waited in the queue. I arrived at port with parish worker Lambert Charle­magne, and we immediately noticed not only the larger number of people waiting to be checked in but also the amount of luggage—what seemed to be tons of baggage, including boxes, parcels, cases upon cases of water, a generator, full backpacks, duffle bags, and roll-on suitcases. All of it stood as testimony to the care and concern of those making the journey that morning. Once the boat company staff accommodated everyone and everything, which seemed nothing short of a small miracle, the ferry pushed off at 8:45 a.m. The nearly two-hour delay was accepted by all as necessary for our purpose. Onward we traveled to our first stop, Martinique. There a similar scene to that in St. Lucia ensued. Many people boarded, and additional relief supplies could be seen ready for tow. Clearly this trip was no ordinary voyage but a humanitarian mission by passengers and crew alike. Two hours after we left Martinique, Dominica came into full view. At that point the lush, green look characterizing the Nature Isle would usually come into focus—but not that day. The barren trees were striking. Brown sticks and mud from landslides replaced the usual vegetation. In place of the colorful landscape, we saw ripped roofs, displaced houses, debris from overflowed rivers, torn-out docks, and fallen timber seemingly everywhere. When we arrived in Roseau, Dominica’s capital, we were not able to dock at the usual port as it too was damaged. We landed farther down at the freight docks, which seemed in relatively good shape. Upon entry we saw a bustling scene: containers being offloaded from cargo ships, relief volunteers and persons from various militaries near and far, dock workers, government personnel, backhoes, trucks, and a helicopter hovering overhead. Gathering our duffle bags filled with supplies for the confreres at two communities, we moved off the dock to a meeting place under a large tent. Greeting us was the friendly presence of Brother Gerard. He came with a borrowed vehicle since the road to Holy Redeemer Retreat Center, where he lives, was still blocked by felled trees and landslides. Our first stop would be to the community in Belfast. 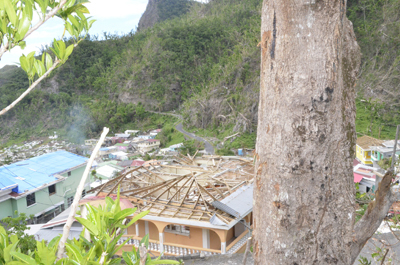 Most roofs were damaged or destroyed in the storm. Flickr photo by The Commonwealth. The ride there would usually be rather simple, but again, nothing was ordinary. Most striking along the route were clothes drying on wind-torn rooftops, upturned vehicles, broken tree limbs, and shattered buildings. Yet rising above the destruction were deeper images of people moving on, doing their best to rise above the tribulation, and through it all to find new life and hope. Arriving in Belfast, we were happy to visit with the confreres. Although signs of the storm were everywhere, they acknowledged their good fortune and gratitude for the gift of life. Supplies were gathered in the garage for parishioners and would soon be collected by and for persons in need. From there we moved on to Eggleston for a visit and overnight stay with the Retreat Center community. The road up the hillside, usually enveloped with lush greenery, was now lined with barren trees. Without the shrouding of leaves, our view of the valley revealed many homes in various states of disrepair. We reached the entrance to the Retreat Center road, normally about a 10-minute drive, in twice the amount of time. Yet the blockage mentioned earlier allowed passage only on foot. Over tree limbs and brush, loose dirt and mud, dry patches, and a fresh spring offering respite, we made our way to the community. Once we arrived, the greeting was worth the walk. A warm embrace by confreres and a local family given shelter spoke of the fact that we were home. A tour quickly revealed the destruction of buildings: in many places, roofs, windows, doors, and walls are gone. Yet again a spirit of gratitude and fraternity marked the welcome, and great fellowship soon followed. 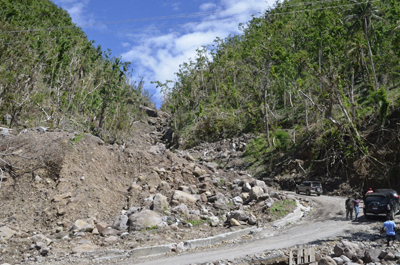 Many of Dominica’s roads were heavily damaged by the recent hurricane.Flickr photo by The Commonwealth. Under the moonlit sky, over drinks and popcorn, we listened to harrowing accounts of the storm, the brutal winds and rains, and the movement of materials heard crashing through the night of Maria. To a person, each one who lived through the event said, “Hopefully, never again!” Transcending the dread of another, though, was a deep sense of faith and joy in communion with God and one another. A calm night passed, and morning followed with rain. The journey back to the road on foot was a bit challenging yet fulfilling. A great night was spent with all present and the boost from the visit enlivened our steps. Over trees and limbs again, this time slipping in some mud and going down knee deep! But it was a small consequence in the midst of greater suffering. On the open road ahead, Father Alistair Elias stood waiting for us with borrowed bus. He graciously transported us to town but not before a change of clothes to shake off the dust and mud. At the port we witnessed many of the same passengers preparing for boarding. The line was long, but this time the number of bags and parcels was noticeably less. Mission accomplished—not only for the Redemptorists but for many others who answered the call of service to others in need. “Did you take relief supplies over there?” the officer asked. I took comfort in the fact that his question linked the Church with service. The answer is yes on the part of so many people. The need is great, and the response continues on many levels. We left Dominica with a promise to return with more supplies. Through the generosity of many parishioners and the Baltimore Province, that promise was fulfilled the following week with a private vessel loaded with priority needs. Please God, the efforts will continue. Click for more coverage of hurricane relief.